Thank-you. Thank-you for entertaining us, for being with us, during the worst hell of our lives. For 22 months now we have been medically displaced, 1,000 miles from home as my 16 y/o daughter first battled cancer, then heart failure caused by the chemo and now lives on the edge of a sword with an electric heart pump [LVAD] as she waits for a heart transplant. Your incarnation of The Doctor, with his whimsy, humour, optimism, hope, childlike playfulness along with the wisdom and deep sorrow that comes with suffering is just what we needed. Throughout the long, heart wrenching months you have looked down on my precious hero from the poster that has been transferred from hospital to hospital to ICU to CCCU to room to room [to room…etc.] to apartment at Ronald McDonald House and now the small apartment we temporarily relocated too in downtown Toronto as this wait for a heart could take another year or two. Dr. Who has been a constant light through it all. We have watched many seasons over and excitedly waited for new episodes that did not disappoint! We have laughed, cheered, gasped and wept. You made my sick child smile and laugh and distracted her from her pain and misery. I have loved other Doctors but none hold on to my heart like you. 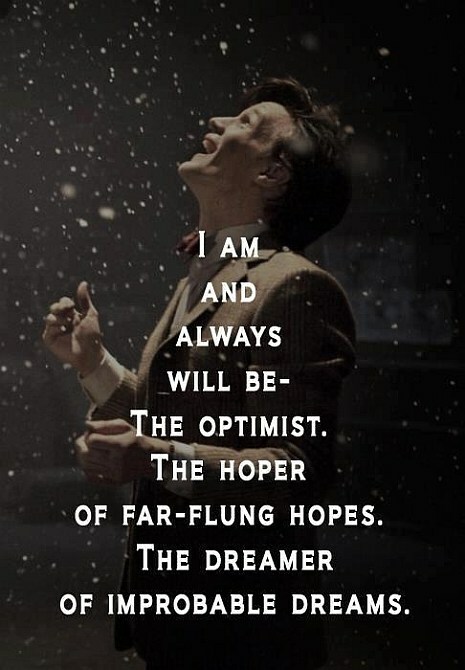 To me you are and always will be “the optimist, the hoper of far-flung hopes, the dreamer of improbable dreams.” <—This. This we have in common. During the hellish weeks we were continually told Bronwyn would not live we didn’t believe it. We believed the impossible and the impossible came true. Thank-you for being there. Thank-you for helping us through. ps: If Bronwyn could have a Make a Wish wish it would have been Dr. Who themed, off to Cardiff for the Dr. Who Experience and maybe even the studio, maybe even a meeting….someday, maybe. Then it seemed just when I discovered the magic of Dr. Who everything was going to change with a new doctor coming. I don’t remember exactly when I my new obsession started but it was before Matt Smith was chosen. I wasn’t really sure how this was going to work. Being a new fan I didn’t quite understand how the Doctor could change so much and still be the same character. The regeneration scene from the 10th to the 11th left me speechless and concerned that my new favourite show had just been destroyed. I needn’t have worried. I believe the 11th Doctor’s interaction with the child, Amelia Pond, helped a lot to endear him to me so quickly. I had heard my girls and other fans talk about “my Doctor”. It seemed everyone had one incarnation of the Doctor that they especially liked, one they felt most connected with, a favourite. I didn’t have one…..until Bronwyn’s diagnosis. As I described in my letter above, Matt’s Doctor seemed to have been created just for us, for me. I generally do not idolize actors, singers, musicians and such. They are just people doing their job to entertain us. I have had the opportunity, during Bronwyn’s health journey, to meet some famous people and although these moments were thrilling they were not emotional or life changing [except when we met Maggie Q for obvious reasons. In case you don’t know she pays our rent while we wait for a heart.]. I can’t think of any famous person whose presence would make me lose it……except for Matt Smith. Such is the connection I feel with his Doctor. I’ll finish off with something Dr. Who and I have in common. We are both 50. We have both had to reinvent ourselves several times due to life circumstances. We have rolled with the punches and enjoyed our successes. We accept our past and have lived through tragedy but won’t let it hold us back. Our drive, imagination, dreams and optimism will continue to propel us forward into the future. Today I raise a glass to us. I think we are both pretty, damn awesome. 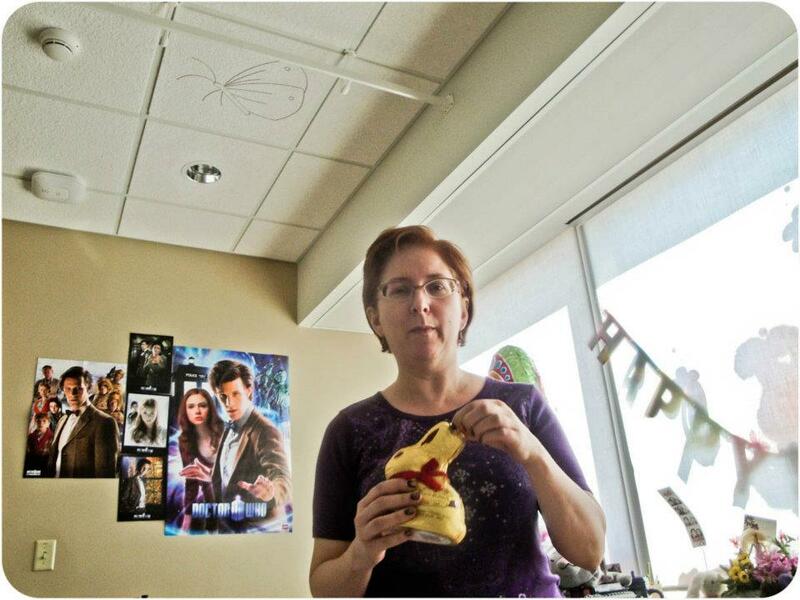 Taken at Easter, 2012, this picture shows the Dr. Who poster collection on Bronwyn’s hospital room wall at the Children’s Hospital in London, ON. She took the shot, from her point of view, in bed. Sinead gave her the large one for her birthday and is the poster that has followed her everywhere and now hangs in the bedroom she shares with her sister in our Toronto apartment. No matter what we were going through the Doctor and Amy were always there, ready to help. This entry was posted in childhood cancer survivor, story and tagged 11th Doctor, AML, Amy Pond, cancer, cardiomyopathy, chemo, childhood cancer, childhood cancer awareness, Children's Hospital, Dr. Who 50th Anniversary, Dr.Who, heart failure, hospital, Karen Gillian, Matt Smith, pediatric cancer, VAD by GoldenCancerMom. Bookmark the permalink.